We review Crookz – the Big Heist, a game we first got to know when we sat down with one of the developers during Gamescom earlier this month. The heist genre has gained some (videogame) traction in recent years. The most notable examples are of course the Payday games, but there have also been some side-scrollers that require you to pull off the perfect heist – a recent example of which was The Swindle. Crookz is very different from all of those, as it’s much more of a tactical planning game than it is an action game. I have to say I never really cared for the Payday games. Having always enjoyed heist movies, the biggest draw to the genre was always the planning aspect, whereas the Payday games focused on high octane action as soon as the heist started and were best enjoyed in multiplayer mode. Crookz is nothing like Payday – the setting is different, the gameplay is different and it’s a single player affair. In Crookz, you control a colorful band of criminals who operate in a 1970s, disco-fueled version of San Francisco. The setting, as well as the art style, is humorous – developer Skilltree Studios is taking a playful attitude towards the 18 heists you have to pull off, tied together by a crazy plot. It involves each and every member of your team being betrayed by a former buddy of theirs, and a desire to get even (and rich in the process). You have six different criminals at your disposal, but you’re only allowed to select and play with four of them during the missions. They all have their special skills, ranging from brute force to speed to being able to sneak or pick locks. Each heist can be completed with any combination of characters, but not always with the same solution. This adds both a level of strategy to your planning process as well as a certain amount of replayability to the game. 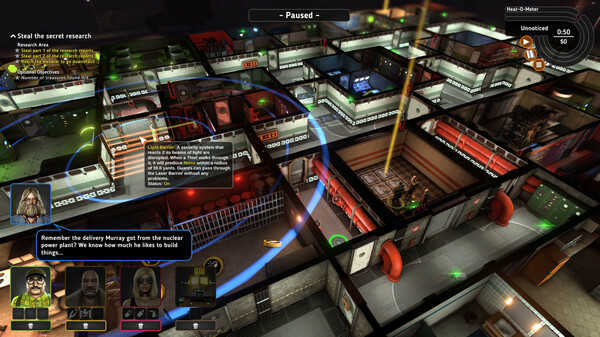 The game itself is controlled using a combination of the pause button and the ability to line up sequences of actions for your band of criminals. You can tell someone to hold steady in a location, and move once the guard is knocked out by your teammate. Or distract that same guard and run away, after which the others can sneak by. Using this pseudo real time tactical dynamic, you have to overcome guards, alarm switches, cameras, locked doors and all sorts of other obstacles that stand in the way of your prize. Quite often this will involve some trial and error, as well as some rewinding – but the end result is always satisfying. One thing we noticed is that it’s best to play Crookz in short bursts. Though the levels offer different settings and layouts, it stops feeling “fresh” after you complete three or more levels in a single sitting. In those cases, we found it to be better to come back to the game a few hours later. We also noticed that the game becomes a little less balanced later on – while you’re completely free to select whoever you want at first, the later levels seem to prefer some characters over others. Pulling off a perfect heist in a smooth fashion feels great every single time though – and practice makes perfect in this regard. Unpausing the game seeing your characters glide past guards and obstacles really does make you feel like a mastermind planner, and that’s exactly what Skilltree set out to do. It may not be diverse and it’s best enjoyed in small doses, but perhaps that’s exactly what 70s funk is all about.